Well it’s March already! That means there is just under one month left to get all the Sale-a-bration goodies you are after! LESS than ONE MONTH! Arrgghhhhhhhh….do you have all of yours yet??? One of my favourites would have to be Honeycomb Happiness. It is soon cute and easy to use – especially when you combine it with matching designer paper, such as the Birthday Bouquet as I have done in the past. This project was a little different. I was requested to make a couple of Easter Cards. Now I LOVE easter – i am a self confessed chocoholic! 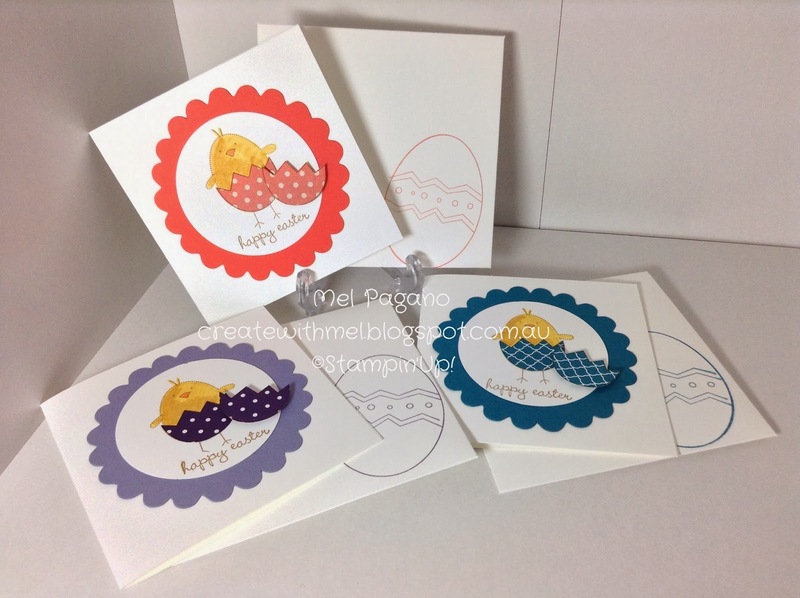 But I don’t do very many Easter cards…..AT ALL! But with the limited Easter Sets we have this year, I knew that little chicken from the Honeycomb Happiness set was going to be perfect. And because it fit the brief for the SUO challenge 143 for March, I thought I would play along with that too! It’s the first time I have played along with the SUO challenges, but those of you who visit regularly know that I quite like a challenge! You can find all the info for the SUO challenges here. And I love a card in a box for a bit of a fancy card…. so here is what I came up with…..
How cute is that! I LOVE how it turned out. I started by picking a nice floral piece of DSP from the wildflower fields DSP (another Sale-a-bration freebie with a $90 spend). I then build my box and colours around that. That’s one of the best things about Stampin Up! Everything coordinates! I featured colours Blackberry Bliss, Calypso Coral, Lost Lagoon and Hello Honey when building this card. I used the Sprinkles of Life set for my little easter basket – and can you guess how I made the little easter eggs???? I used the little spoon from our new Cups and Kettles Framelits Dies. I just trimmed off the spoon tip and stamped with some mini stamps (the Perpetual Birthday Calendar Stamp set is perfect for this, but you could use any little stamps you have!) And to save me colouring my chicken, I just stamped him directly onto some Hello Honey Cardstock. Too Easy!!!! I hope you enjoyed these projects. Don’t forget any $90 order earns you any Sale-a-bration item for FREE! PS – Do you have a HUGE wishlist??? Why not join the fun and build your stash! For only $169 you get $295 worth of any product of your choice. That’s $126 worth of product for FREE!!! HURRY – only until March 31st! Hello and welcome again to another Blog Hop. Today I am joining in with our team ‘Eureka Stampers’ to showcase items from Sale-a-bration. Sale-A-Bration is that fantastic time of the Stampin Up year where you get one FREE item for EVERY $90 you spend! As well as an amazing joining deal – this year you can Join in the fun and receive $295 worth of products for ONLY $169. Bargains! Do you know we are HALFWAY through Sale-a-baration already??? Have you taken advantage of all those wonderful free items or that amazing joining offer that’s available yet? And now – today – even more goodies have been added! How good is that! You may have joined this hop right here – or come across form Heather’s Blog. Be sure to hop all the way around. There is links to everyone’s blog at the end of the post in case you get lost along the way. Today I am sharing with you a couple of ‘Magical’ Cards that we have been making in class this week using the Honeycomb Happiness stamp set. These type of cards are referred to magical slider cards. You start with a pain black image, but as you pull out the slider, the image magically becomes coloured. Isn’t the little chicken in this set just so very adorable! It looks like a normal – albeit a bit boring – card so far – but just wait for the magic…..
It’s hard to put into a photo as you really see the magic happen as you pull the slider. I used one of the sheets from the Wildflower Fields DSP (another FREE sale-a-bration item) and simply randomly coloured a few of those spots with colours from the subtle collection. Here is another example using the ice cream and the Birthday Bouquet DSP. The Honeycomb Happiness stamp set is perfect for this type of card as it has lovely ‘open’ images that allow you to add a lot of colour, making it very effective! Would you like to make one of your very own??? Jump on over to my Youtube video here. 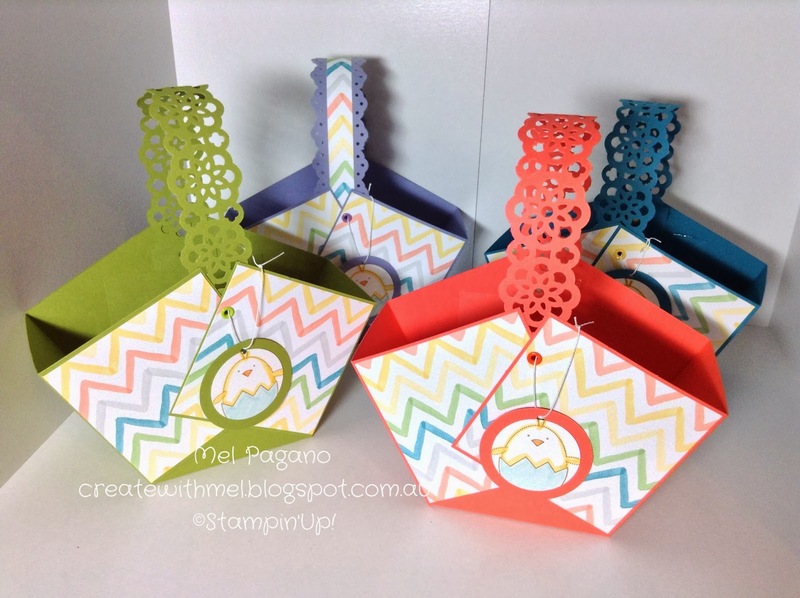 I tell you – they are soon much fun to make and have been a HUGE hit in class this week. 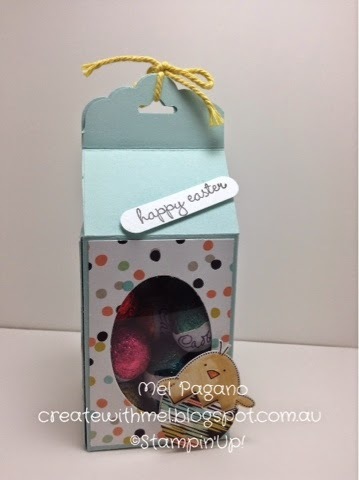 Now the title says Easter Box, but this gorgeous little box could be used for any gift. I found a tutorial on Pinterest for a smaller version of this box. I really wanted to be able to add a bigger hunting Easter egg to the box, and I wanted to be able to see what was in the box. I have made this box with an a Good Egg Easter. I made another with the gorgeous little petite petals stamp and punch. 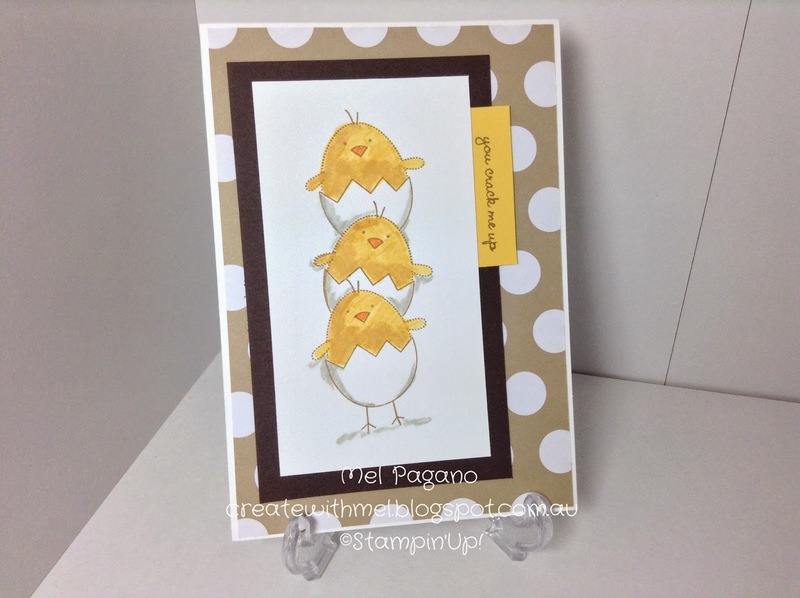 I also used the punched oval shapes to add ‘eggs’ to an Easter card – I always try to use my ‘scraps’. No Way! You are seriously not doing EASTER already! Well…yes I am…I did….BUT it’s only JANUARY i hear you scream…..I know, I know, but i was having sooooo much fun…and I saw Hot Cross Buns in the shops! That counts, right???? Lol. Aren’t they gorgeous? And the new Watercolour DSP from the new mini catalogue being released on the 28th of this month, had just thre right flair for the project! Very ‘Eastery’. It reminded me of drawing and decorating eater eggs when I was a kid. And I absolutely adore this stamp set….I know it’s retired, but sometimes an oldie is a goodie! This card I totally CASEd from a google image, but it was just sooooo cute…in a grown up way, with grown up colours I had to reproduce it. I believe it was from Inking Idaho in the USA. She always does a fabulous job! So what do you think? Was I a little enthusiastic in beginning Easter this early? Lol. If you are interested in learning how to make some of this stuff, or would love to give it a go…send me an email using the little green envelope at the top left hand corner of the blog home page, and while you’re there you can sign up to follow every post I make and for my newsletter outlining classes and promotions and tips and tricks…what are you waiting for???? ?